Revolutionise your meeting room and classrooms with our brand new Interactive Touch Displays with MeetingPad. Replacing the old Interactive Touch Display range these are the perfect presentation, collaboration and learning tool. Available in 55”, 65” and 70” screen sizes the displays have a light-weight, sleek design with a thin profile achieved by using a segmented aluminium enclosure and a moulded polymer rear (excludes 55” model). The future of effective interactive whiteboards has now arrived ready to transform your presentations, meetings and lessons for the better. Free MeetingPad Software – The fully integrated powerful Android system allows you to control anything and everything on the display, such as previewing inputs or annotating directly over your images, presentations, documents and webpages; even when displaying from your laptop. With no additional hardware required this is the all in one solution you have been waiting for. File Sharing – Share files directly from the Interactive Touch Display to your Windows, Android or Apple devices. Great for saving annotated notes or lessons, files can be shared via the easy to use Eshare app, email or QR code. Files can flow effortlessly between the Touch Screen to your devices and vice versa. Optional OPS PC – For seamless integration into existing networks a Windows OPS PC can be integrated into the rear of the display. This allows you the flexibility to choose between Android and Windows and switch effortlessly between the two. A cost effective OPS PC or a more powerful OPS PC are available. Easy Access Ports and Controls (excludes 55” model) – Quickly and conveniently connect your own laptop to the screen using the front facing HDMI and Touch USB ports. Great for teachers or during lessons and presentations the ports and controls allow you to fully control the Interactive Touch Display. Free Smart Pen & Styluses – The Interactive Touch Displays come bundled with a variety of styluses and smart pens. The smart pens allow you to control the display wireless from anywhere in the room. The smart pen will become an invaluable tool from changing the pen colour to navigating between slides in presentations. 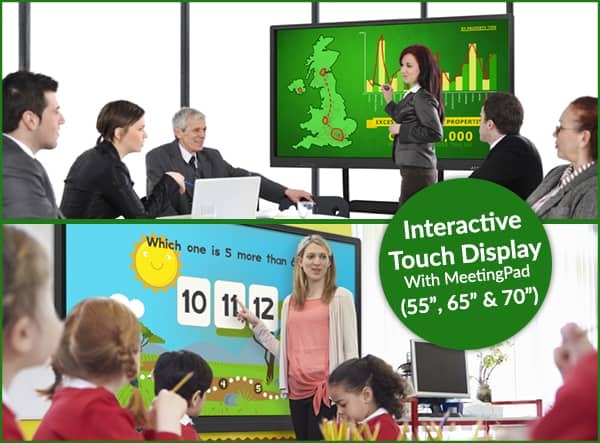 We have 55”, 65” and 70” Interactive Touch Displays with MeetingPad in stock now and available for immediate dispatch. Get in touch today to take advantage of these unique Touch Screen displays.